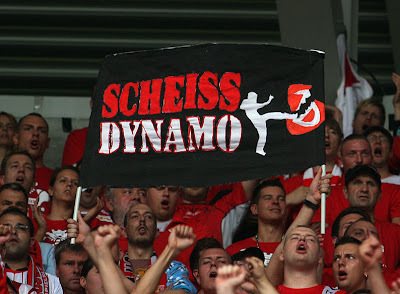 I knew about the rivalry between FCU and Dynamo Dresden, but I didn't realise Dresden had the same unsavoury image as BFC. I don't think any ex-GDR club is completely free of that sort of element in its support though. Obviously some are worse than others, but I've seen a few Thor Steinar shirts at the AF. I think the Hertha-Union fan friendship in the 1980s occasionally involved Hertha fans from the Hertha-Frösche and 'Zyklon B' fan groups as well. I think Friday night games are brilliant if you can actually get to them. But it does seem unfair on supporters, especially away fans. 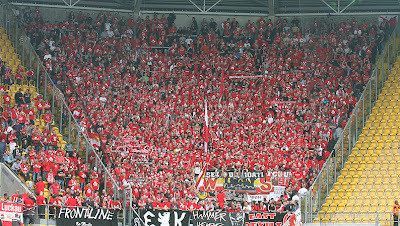 I was impressed by how many had been able to make the trip from Paderborn the other week. Or how many Paderborners work in Berlin and were able to duck out early. Really interesting post, a Union away game is definitely something I want to experience at some point. What does supporting a club have to do with politics and/or ideology? If that's the case you'd have to condemn half the football fans in Eastern Europe. Because club culture, especially in Germany but Europe-wide, tends to have a huge bearing on how fans perceive themselves. It's not always accurate, and as I said in my reply a club like Union who are generally quite alternative also have a small right-wing element. But other clubs, such as BFC and Lok Leipzig and apparently also Dresden in Germany, Lazio in Italy, Beitar Jerusalem in Israel and so on, are well-known for their right-wing fans. A better question would be, what is football without the cultural, ideological and political context? Giovanni, it depends where you watch football really. In the UK it's not so much of an issue, but the reason I support the club I support is because I'm not that keen on being surrounded by people singing about building an underground from St Pauli to Auschwitz, for example. @Tom. Yeah I've seen a fair share of unsavoury characters at FCU, although the proportion is considerably lower than that at, say, BFC (urgh). I remember reading an interview in 11Freunde once with someone (vague, I know) who said that pretty much the only place in the former East where you wouldn't find any Neos would be Jena. Well, to be fair, many Eastern German clubs are doing their best to push out the unsavoury fan groups (after many years of doing nothing). Afaik as I know, there has been no problem with Dresden fans yet this season. No problems yet, but only because they've all been threatened with stadium bans and the main sponsor threatened to pull out.